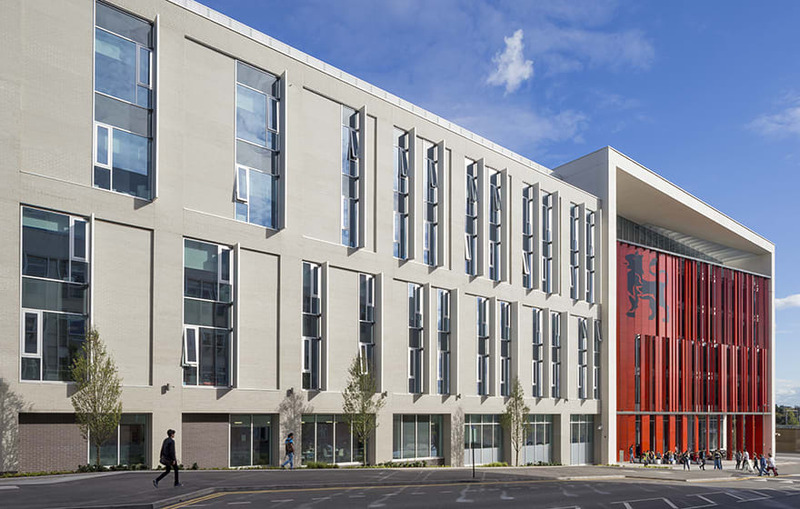 The first building to fully road test Birmingham City University’s ambitions as a client, the Curzon Building, required a comprehensive set of FM deliverables in BIM, including one of the most accurate 3D models ever produced. The £46.2m project forms a key element of the University’s ongoing expansion around City Park and was designed to act as a “front door” and student hub for the campus. It comprises a large two storey block, featuring a library, catering, student services, a student’s union, and the Grade II-listed Eagle and Ball pub. Plus two wings of five- and six- storey accommodation linked by a central atrium house, faculties of Business, Law and Social Sciences, and Arts, Design and Media, and the University Directorate. The project represents an evolution of BIM learning from the previous Parkside Building, the university’s first ever project carried out in BIM. Rather than go down the COBie route, internal consultations were held with FM and estates teams to identify the exact data and information required and a bespoke schedule was developed, referred to as an Asset Information Matrix, specifying what information should be included in every BIM object. Ideate BIM Link was used to export schedules of BIM objects relevant to each work package from Revit to Excel to enable completion of as-installed data by the subcontractors and installers. These schedules were then re-imported into the Revit models to populate the original BIM objects with the as-fitted data for FM. Associated Architects was appointed BIM manager during design, as an extension of its role as lead designer, coordinating models produced by M&E consultant Hoare Lea, structural and civils consultant White Young Green and landscape architect Atkins. This responsibility was passed on to main contractor Willmott Dixon on contract award and the scope expanded to include coordination of models and data produced by M&E contractor NG Bailey, plus those of novated consultants and all subcontractors. 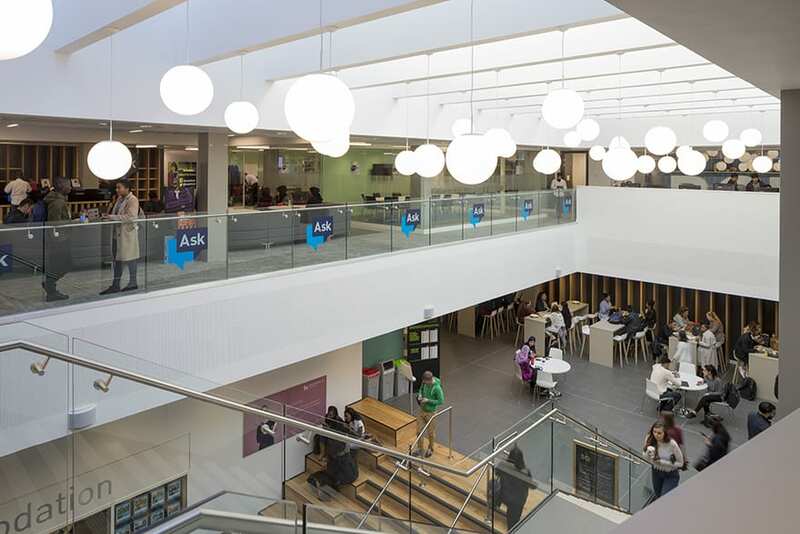 Revit was mandated as the main design tool for all consultants and contractors, from RIBA Stage 2 through to practical completion, with the long-term view that the software would be used by the university’s FM team to manage the building post-handover. During design, the clash detection process was streamlined using Autodesk BIM 360 Glue, which enabled models in Revit to be exported to the cloud and viewed by anyone in the project team via an internet browser. Around a dozen clashes were picked up, saving Willmott Dixon about £10,000-£30,000 per clash, in terms of onsite remedial work, depending on the severity, says Simpson. During construction, iPads running BIM 360 Field were deployed to streamline snagging and onsite checking processes. The process was exploited to robustly test BIM 360 Field as a key FM deliverable, giving the client a complete record of every issue picked up on site during construction and detail of how it was rectified. The FM team can scan bar codes fixed to doors with their iPads, and the BIM 360 Field app will then open the model to a view of the room. Touching on any object in the model then displays embedded data from Revit, such as the original design information, various tasks and check lists, with links to all the relevant drawings, stored on the university’s Microsoft SharePoint servers. Simpson comments: “All information is organised based on the NRM3 classification system, which in turn maps to the standard SFG20 maintenance regimes, with check lists to assign what FM work needs to be carried out on each component. The fact that BIM was an FM deliverable required greater effort to ensure the accuracy of 3D geometric models. A laser point cloud scan of the entire building was carried out at several points during construction: before floors and ceilings were installed to map all voids, and post-completion. The BIM models were then audited against the point cloud surveys and, where necessary, updated to align them with the scans. 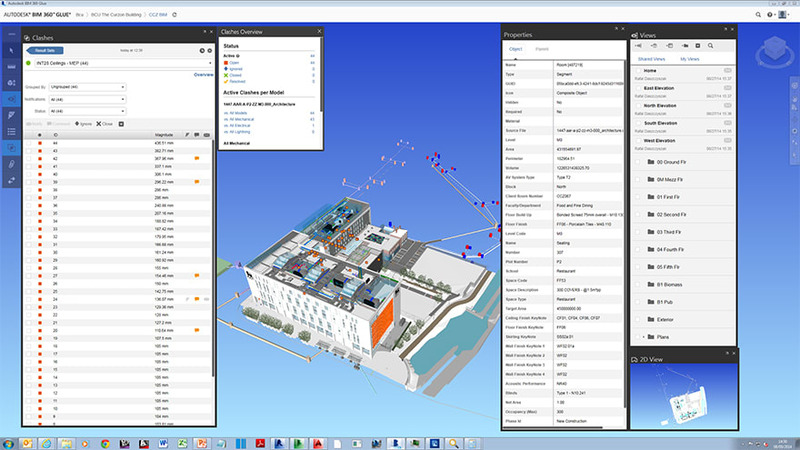 BIM 360 Field was used to flag up which point cloud items needed to be addressed and pass on ownership of each task. Model accuracy was further improved by incorporating numerous photos of every room, including service runs concealed under ceilings. 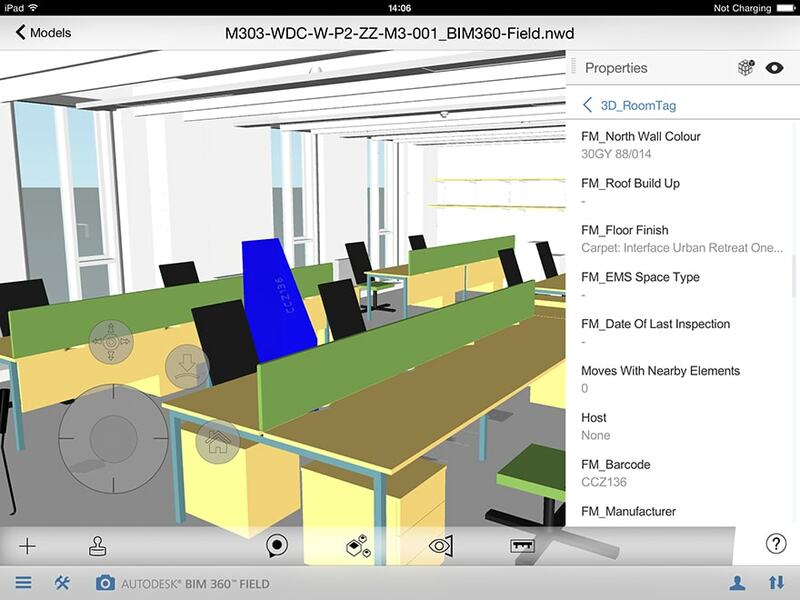 “If the FM team is notified of a leak in office or classroom, they can use BIM 360 Field to check the location of any hidden services and photos of what is behind the ceiling tiles before disturbing it,” says Simpson. The Curzon building was completed last summer, and the extension to it, Curzon B, is now underway. The new project will implement BIM even more fully, featuring a fully realised landscape model, and more detailed 3D models from steel fabrication suppliers for the primary steel frame and SFS.